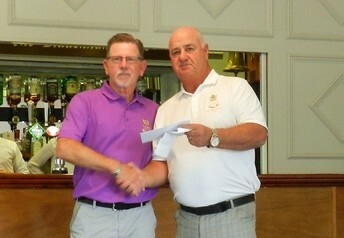 First place went to James Anderson with a very good score of 42 points. Our thanks go to the President, who generously provided prizes for the first three places. 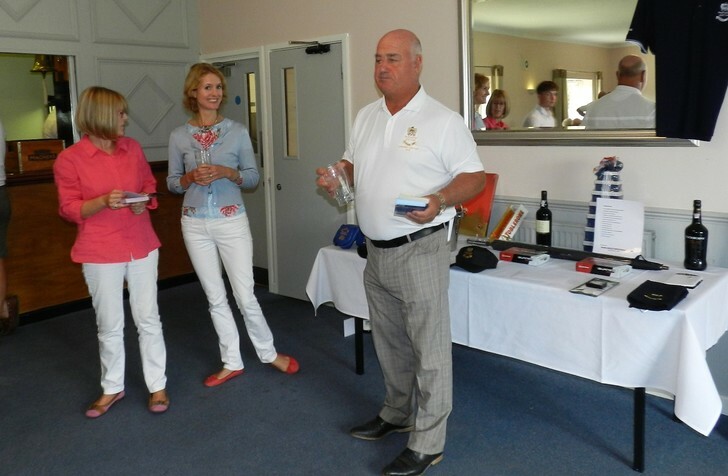 Our captain, Phil Rajotte, also managed his best ever front 9 …. 2 over gross and an impressive 25 points. Robbie Receives His Best Christmas present ever! 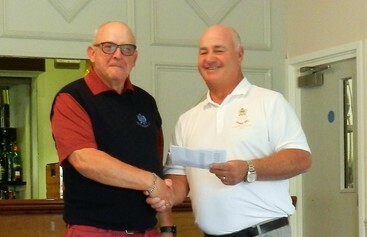 One of our illustrious seniors – Robbie Brown, received a generous golf voucher from his family at Christmas. He promptly invested in a few golf items, which included a new hybrid club. On the very first outing with his new club, Robbie hit his drive just beyond the trees on the first. No big deal I hear you say - but with around 160 yards to reach the pin, Robbie took out his new hybrid for the very first time, convinced that this would get him somewhere near the green. Robbie swung the club cleanly through the ball and it disappeared over the fairway bunker towards the green. 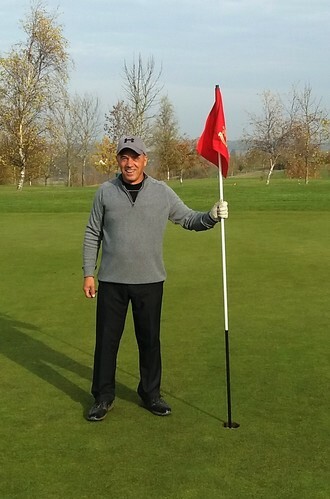 To the amazement of his playing partners who were watching his shot from further up the fairway, Robbie not only got to the green, he reach the pin and the ball dropped in for an Eagle Two! As Robbie was heard to say afterwards, "...that's the best Christmas Present I've ever had."! Robbie has also studied the new golf rules in some detail and has given some very positive feedback. Always one to have a view on things, Robbie hopes they will help to move the game along a little quicker especially around the greens. Well he proved his point on the 1st, albeit in an unorthodox manner! 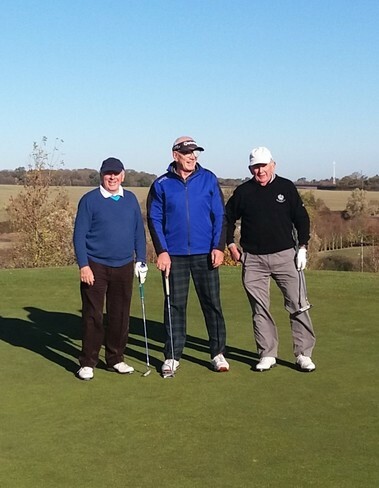 The weather may be getting colder and the days getting shorter, but with the course playing so well it's been a great month of golf for the Men's Seniors' at Bedfordshire. 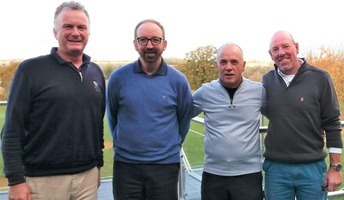 The annual Greensome Stableford also took place in November and it was won on a tight countback by Clive Harris and Gary Glover. Captain Tim decided to sport the latest (very bright) Seniors ‘winter look’ on a Greensome day! Sunglasses required? The Winter leagues are going extremely well and have been well supported. The early leaders are John Mather after a superb 41 points in the last round of the ‘yellow league’ and Nick Serrecchia off the whites with some steady scoring. It’s still not too late to join the leagues or just play a qualifying round. Just turn up on in the bar on Friday and the starter will gladly book you in with a group of players. Full details on the seniors notice board. Well, Ruby’s services were not required as our Seniors were greeted by blue skies and excellent playing conditions. 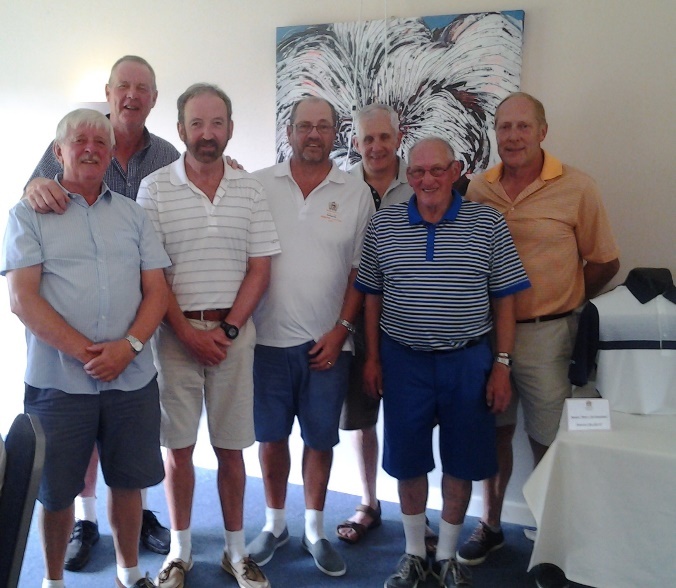 Round 1 Top 3 results were as follows: Graham Crawford 35 points, John Porter 35 points and Mick Field 33 points (Graham pictured here with his playing partners). The first round of the yellow tee league is on Friday the 9th from 8am. Absent Friends trophy - After the early morning fog cleared, players enjoyed near perfect conditions with a gentle breeze, warm weather and excellent greens. This was reflected in the superb scores right across the field. Our winner was Trevor Pasquire with 42 points followed by John Mather on 41 points and Tim Whitwham 39 points. Well done. Following a great Captains Day, there was no stopping our Seniors Captain Tim Bailey with his Bright and Beautiful and Loud and Proud theme. Captain versus Vice captain was won by the Captain so enough said about that!! Following that defeat, Phil took some coaching lessons from our very own Mr Motivator – Jim Heaney who kindly took him under his wing for the home match against Aspley Guise. Jim knew exactly how to get the best out of Phil ….. promised him the match ball he found in the woods on the 14th. 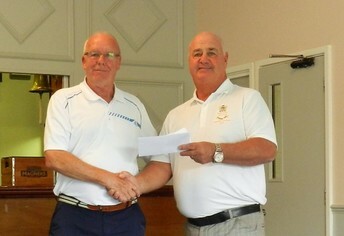 Photo 4 – Jim presenting Phil with that ball after he sank the match winning putt. Photo 5 – Jim does it again against The Bedford. Motivating Ding with the ‘hidden 6 iron technique’ – legend!! As of 28 September 18 we have played 23. Winning 12, Halved 4 and lost 7. We have 2 matches left to play - Buckingham and The Bedford away. 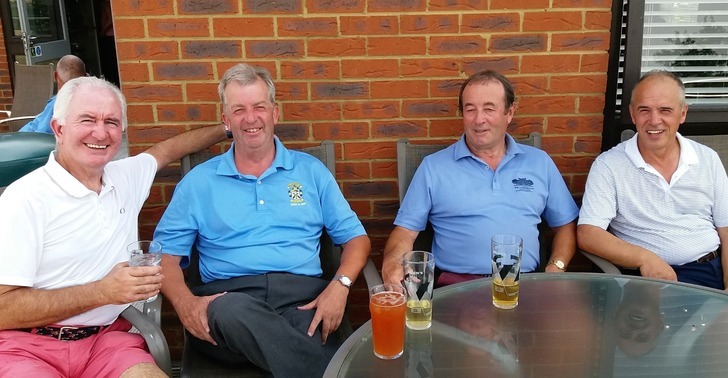 Due to very poor take up of the AGM dinner, the Captain and Vice captain have decided to cancel the AGM dinner and switch it to the 5th December immediately after the 9 hole Stableford and Christmas lunch. This should ensure that we have a wider and more representative attendance at the AGM. - Cash placed into a brown envelope and put in the seniors box in the men’s changing room. The envelope must be clearly marked with your name. Please sign up to one or both leagues as entry will closes on the 31st of October. Signing up means that you can play as many or as few of these handicap qualifying matches as you wish. You will also be eligible for any prizes/trophies and SJT points. This is just a great way of maintaining your handicaps with qualifying scores from white or yellow tees during the winter. For further details, please see the sign-up sheets on the Seniors notice board. The great day finally arrived for our Seniors' Captain Tim Bailey. With near perfect weather, not too hot and not too cold, light winds with firm fairways for those extra long drives and greens that were true, conditions were ideal. The half way hut was manned by Michelle, Edna and Fiona serving a range of pastries, biscuits and cakes with refreshments. 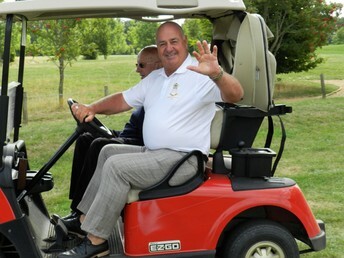 As always, Colin was at hand to make sure the day of golf was well organised and running smoothly for our seniors. Colin and Seniors' Captain Tim can be seen here patrolling the course to ensure events ran smoothly. 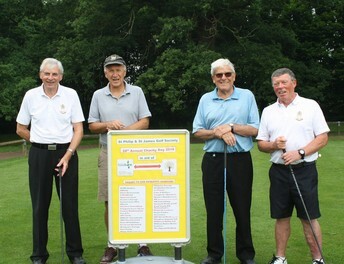 Great weather, excellent greens and ‘fast’ fairways – perfect seniors’ golf! 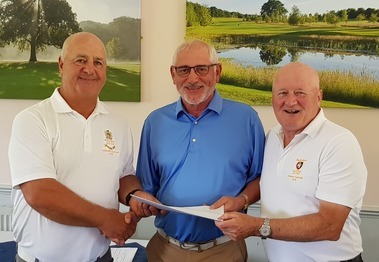 On behalf of all our senior members, Captain Tim would like to extend his gratitude to John Gubb and his team for doing a fantastic job in maintaining the course in such great condition in what has been a very challenging season. It’s in all the way in Mark – easy on these greens!!! Our catering team & bar staff keeping our seniors fed and watered – thank you. The raffle raised and impressive £560 taking the total for the year to nearly £3,000 for Tim’s charity – Willen Hospice. The raffle tickets sales team of Michelle and Fiona can be seen looking on as Tim announces the winners. As to the golf, some very impressive scores were posted by our seniors. 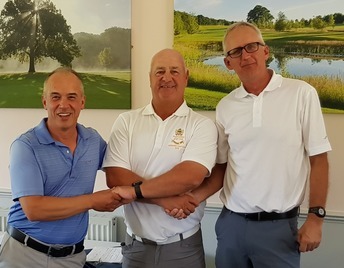 39 points didn’t even get a look in with Robbie Brown continuing his excellent form from the senior club matches to bring home a stunning total of 43 points to claim the top prize. and Ted Hall on 40 points. 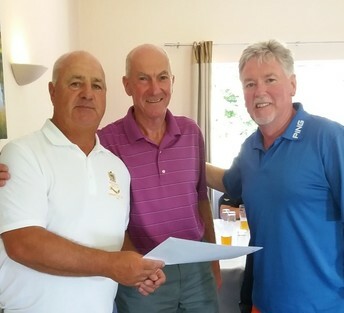 There were also prizes for nearest the pin which were won by Wilf Mannion, who rolled his tee shot all the way down the 6th to finish just a few feet from the pin, and Jim Heaney on the 13th with a more traditional approach shot! One last thing … we just couldn’t fail to mention the happiest man of the day – our very own Nick Turnbull who couldn’t wait to get his hands on a personally signed poster of Gordon Ramsey! 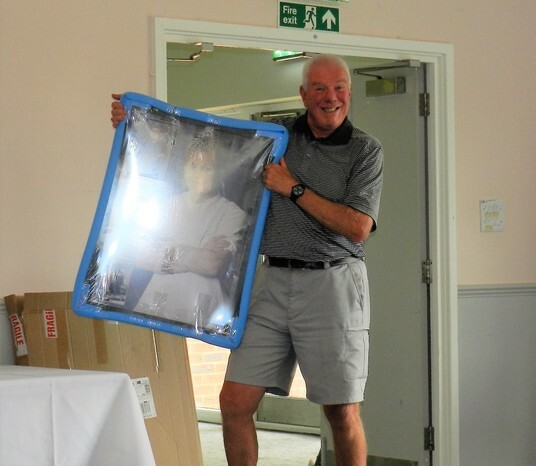 Nick can be seen here - ecstatic with a poster of his idol. Last but not least, a big thanks to all our members who took part and made it a special Captain’s day for Tim. And a final reminder from Captain Tim …… don’t forget to book your table/place for Ladies night. Entry sheet is on the notice board! 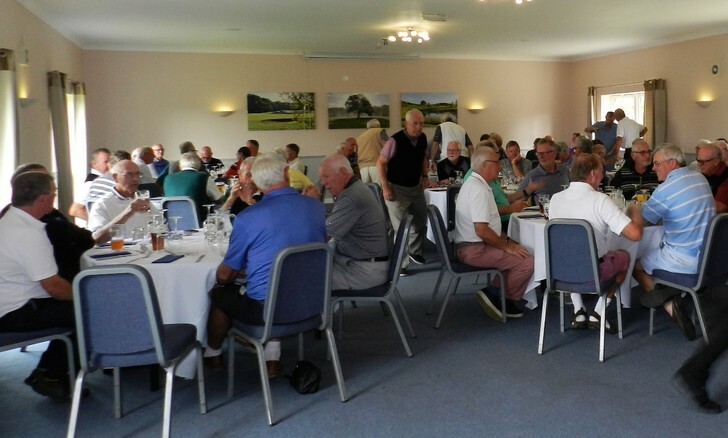 On the 1st of June a team from the Bedfordshire Golf Club took part in the annual St Philips and St James's Charity Golf Day held at Mowsbury Golf Club. John Pepper won the individual event with a score of 40 points contributing to an overall team score of 119. 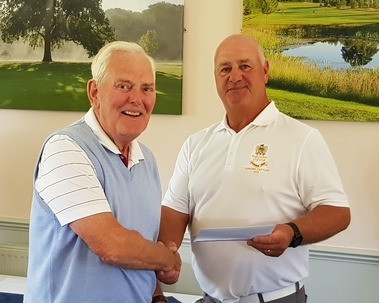 We subsequently learned that John not only won the over 60s singles trophy but was the oldest of all the 116 participants at the ripe old age of 81. Well done the team and well done John …. may it long continue. After years of trying Jim finally gets his man - and what a great smile to go with it. 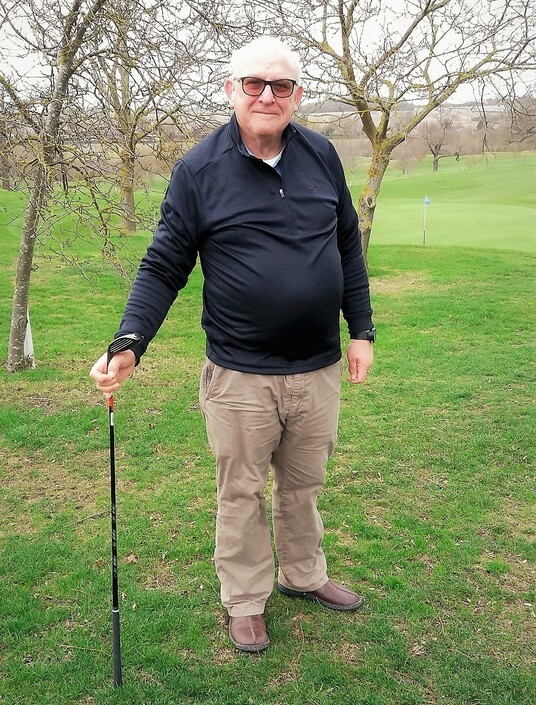 The seniors match against Wellingborough GC saw Jim pitted against his nemesis, none other than Andy Charter of Wellingborough Golf club. An inspirational team talk before the game by Jim, ‘ I’d really like to beat this bloke so you’d better play well Nick’ was all that was needed to inspire the team. 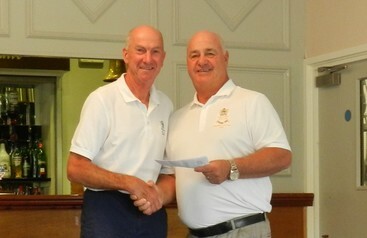 Jim finally pulled it off with a 3&2 win which helped Bedfordshire win the match against Wellingborough. Breaking news ……. 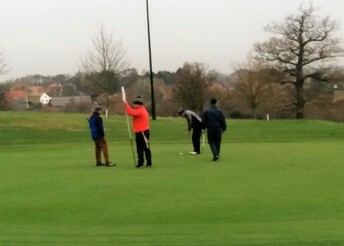 Bedfordshire Seniors managed to beat Pavenham GC 3.5 to 2.5. Very well done boys! 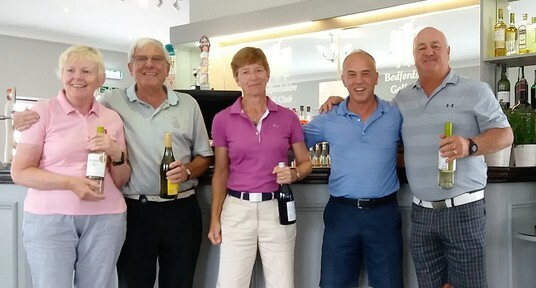 The annual Mixed Seniors Texas scramble was held on the 30th July. 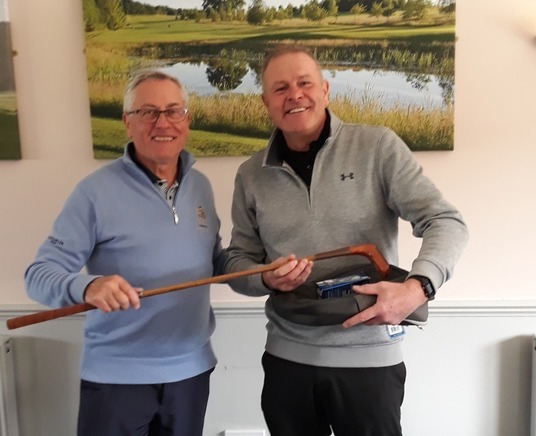 It was an excellent day with the competition played in the true spirit of the Bedfordshire Golf Club ….. the respective captains winning with an impressive gross 58.1 and duly presented themselves with the winning prize! Our National Seniors Pairs Champions, Nick Serrecchia and Mark Lewin started the defence of their title in April of this year. They safely navigated through the early rounds getting past some tricky opponents and golf courses!! In the fourth round they were drawn against a pair from Langdon Hills. 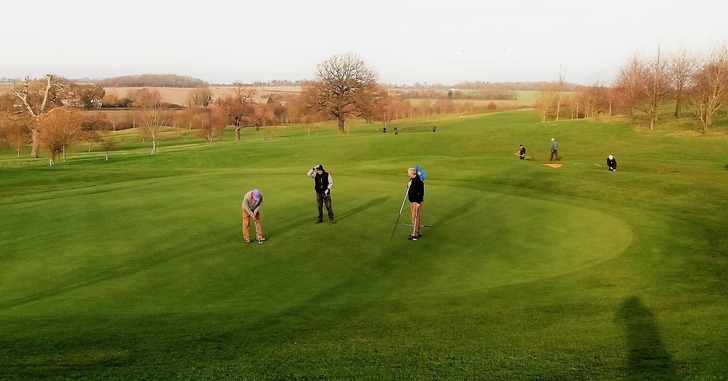 On a glorious day at Bedfordshire Golf Club our intrepid pair knew they had a battle on their hands when their opponents won the 4th and 5th to bring the match back to all square. 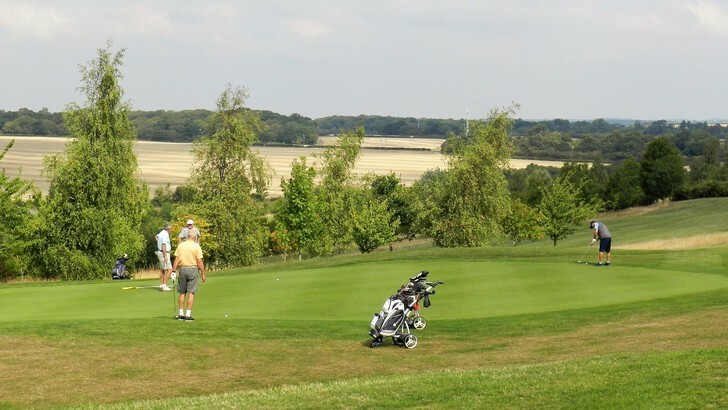 On the 6th, with the green keepers and other members kindly stopping to watch, the pair from Langdon Hills found the green from the white tees to put further pressure on the home pair. 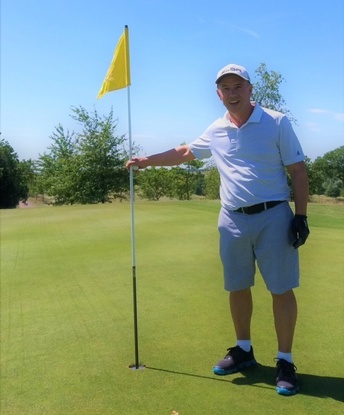 Ever one to step up to the challenge, Nick then pitched his ball onto the well-watered green and his ball rolled a few yards forward before dropping for Hole-In-One! That wrenched the initiative back and made all the difference in the match, with Nick and Mark never looked back from this point to pull off a 3&2 win to march on to the last 16. We wish both of them the best of luck in the next round. After much deliberation and many last minute entries the day was, by all measures, a great success. The open and flexible format led to significantly more entries than previous years with a total of 84 on the day. 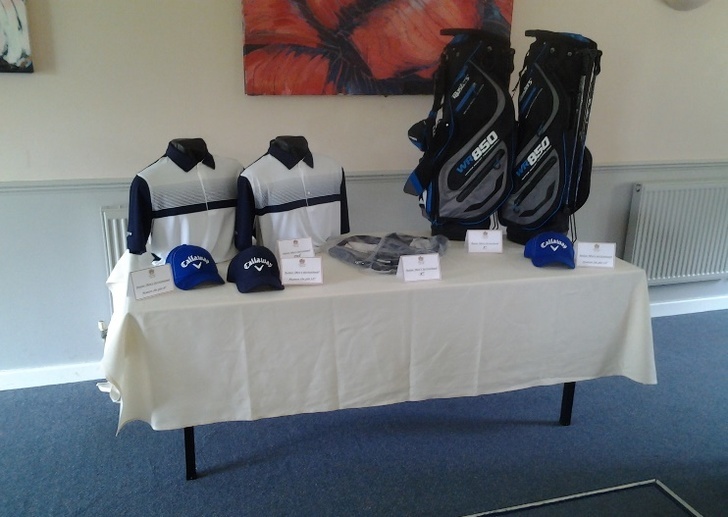 Captain Tim organised some fantastic prizes including a round for 4 at Woburn Golf club. There was also a raffle and an auction which raised significant amounts of money for the charity – a total of over £2,000 on the day. Tim would like to thank the committee for all their help, guests and members for entering and contributing so much to the day. We would also like to express our gratitude to the club, the catering staff, bar, our admin team and our green keepers for our wonderful course. Seniors Invitation Day was a great success. With very high temperatures of up to 30C the field was a bit smaller than normal, but still had 26 pairs involved. This allowed continuous movement around the course and meant no hold ups on tees, which would have been a challenge for many, given the high temperatures and lack of wind. 10 pairs scored over 40 points which is quite amazing given the heat. Feedback from guests and members indicated that they had an excellent, well organised and managed day, with good food, lovely cakes from the Half Way hut and plenty of cold drinks!